One of the most profound mysteries of life and our Christian journey is found in this text. The Apostle Paul was being persecuted, tempted and mocked both inside and outside the church. But he did not stop his work for God; he was clear. God has made his marvelous light to shine inside the confines of our frail human flesh. We are aware of our own failings, faltering, weaknesses and our sins. Satan uses all of them to accuse us; Satan tries to make us hide the light that is in us (see Matthew 5:15-16). We also experience being hard pressed, perplexed, persecuted and being knocked down in life. Wearied by life, we will be tempted to dim the light within us. Don’t do it. For, the mystery of God is this . 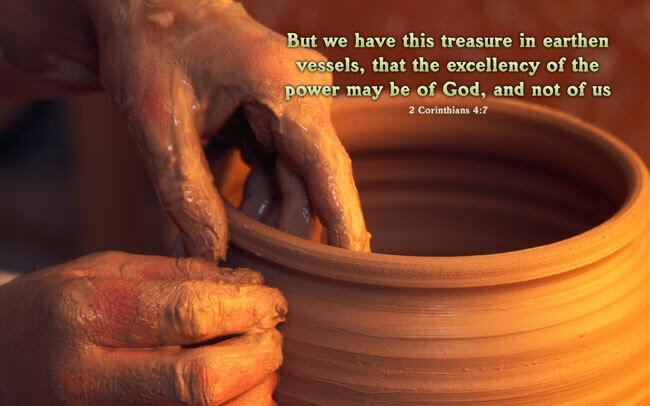 . . knowing that we are weak like earthen vessels or jars of clay – God chose to make a rich investment in us. He deposited his light and the knowledge of himself inside our hearts. And, it is precisely because of our weakness and our frailty that God’s “all surpassing power” is revealed in us and through us. In our weakest and most fragile moments, God’s strength and light shine forth (see 2 Corinthians 12:10). God has made a great investment in all of us who call his name. Let your light shine – especially in the darkness. (see John 1:5). God’s Light (verses 4-5). Paul, who used to attack the church, is now a light and being attacked because of the church. He was very aware of the presence of light and darkness. What does verse 4 say about Satan, the light of God and unbelievers? God’s Light in Us/The Great Investment (verse 6-7). God has deposited this marvelous gift, his light, in our hearts. Reflect on this truth as described in verse 6 – God “made his light to shine our hearts.” How does that make you feel? In verse 7, he calls it a treasure which is also translated as “a deposit.” What does it mean to you to know that the God of all creation has invested his light in your heart? 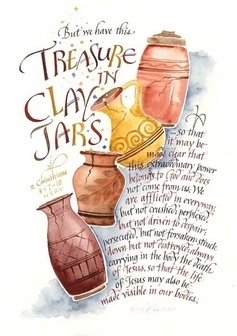 Earthen Vessels/Jars of Clay (verse 7). Here is the mystery. Paul knows that we have the light of God in us (hopefully you do too). But, he also know himself and his weaknesses and the weaknesses of mankind. He says God has made the investment in a fragile vessel, like a clay pot. What are things about us that are weak or fragile? Our Weakness/His Power (verses 7-8). The mystery is continued. He invests in our weak frames that His power may be revealed. The bible tells us when we are weak he is strong. (See 2 Corinthians 12:10). What does verse 7 say about our weakness and God’s all surpassing power? How is God’s power revealed in our weakness, or our being pressed, persecuted or perplexed as in verse 8? How have we experienced God’s great investment (his light in our hearts) in our times of weakness and fragility? Do we see the light of God shine in us to his glory and for the benefit of others? My prayer for you is that you will know both God’s power and his grace. That you will understand in your head and your heart that God has made a rich and powerful investment in us. He knows all of our frailties and still pours into us. Do not lot them stop you from letting your light shine so that others will be blessed and God will be glorified.